The Penguins have indeed taken advantage of this road trip to get back some of their winning power. Taken from the schedule below the Pens have won 3 of their last 4 games on the road with a final stop at the future home of the 2010 Olympics, Vancouver. The Canucks are coming off of two losses to Nashville and Minnesota and are 2-2-1 in their last 5. The team should be well rested having not played since Wednesday. Most notable player is Henrik Sedin with a league high 64 points and vying for the NHL's Most Valuable player, the Hart Trohpy. Generally these teams will only meet up once a year. The last time these teams met was 14 months ago and Michael Therrien was coaching the Pens. The Canucks ousted the Pens 3-1 with a strong night from Canadian Olympian Roberto Luongo. Official recap [here]. SCORE EARLY: As we saw against the Oilers the Pens were as flat as I've ever seen in the first 40 minutes. Great comeback indeed, but they cannot do the same against a team with the 3rd best home record, 4th best powerplay percentage, and the 5th most goals in the league. Taking the crowd out of the game is crucial. GOALTENDING: Tonight will be interesting with MAF out with a fractured finger and John Curry from WBS filling in as netminder. Curry got a shot last year in 3 games and went 2-1 with a .913 save percentage. If Curry wants play in the NHL for the duration tonight would be a good place to start. 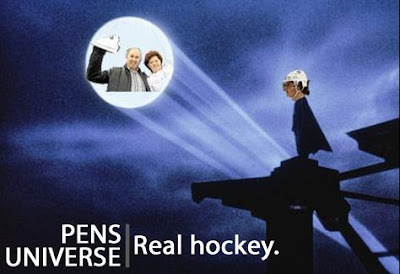 SUPERMAN: Despite being blanked in Edmonton, Crosby has been superb in the past 5 posting 6 goals and 8 points. Currently 4th in the league in scoring and 2nd in goals, Sid needs to lead his team as he has been and give the folks in Vancouver a preview of what's to come next month. PENALTIES: As stated above, the Canucks are 4th in the league in converting on the powerplay. The Pens have to play smart and not give the Sedin brothers a chance to add to their point totals. SESAME STREET: Matt Cooke returns to play his former team since being traded to the Capitals in 07-08. Though he says there is no bad blood, he's sure to come out with a little extra energy. And when he does, so follows his linemates Staal and Kennedy. Crosby, Stall, Fluery, and Bylsma on the comeback against the Oilers. "That's a once in a lifetime opportunity with it [The Olympics] being in Canada. I'm just trying to worry about things (in Pittsburgh). When it's time, it's time." Sidney Crosby, staying focused.